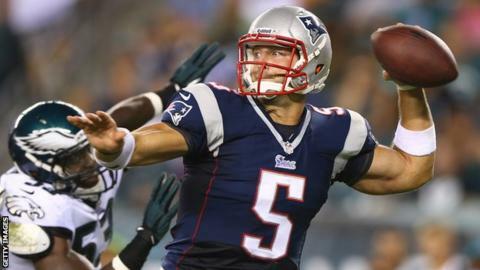 Philadelphia Eagles have signed Tim Tebow on a one-year contract. The 27-year-old former Denver Broncos quarterback has been working as a television pundit after his release by the New England Patriots in 2013. Tebow, whose last appearance in the NFL came in 2012 for the New York Jets, won the Heisman Trophy in 2007 for the best player in college football. The details of his contract with the Eagles, with whom he trained last month, have not been revealed. A committed Christian, Tebow is famous for going down on one knee in prayer to celebrate touchdowns. His new team have four other quarterbacks - Sam Bradford, Mark Sanchez, Matt Barkley and GJ Kinne - on their roster. Is Rodgers still right for Liverpool? Read more on Liverpool: Why have they struggled - and what is next?